This Sunday saw NSA South West region visiting the Rampisham Manor Farms in Dorset to see how Gareth Beynon and his team manages the farm’s flock. In spite of the mixed weather a large crowd turned out and were treated to an informative tour of the farm. Since taking on management of the flock four years ago Gareth has worked hard, dramatically increasing the size of the flock and land in-hand. The group saw how he has used fodder crops and improved grassland management to finish his lambs, and his impressive flock of cheviot mule ewe lambs and main flock. 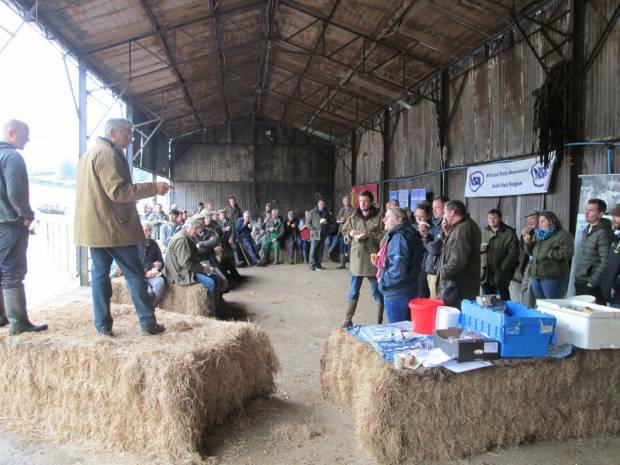 The group heard how Gareth and his team are working with their farm vet Emily Gascoigne to reduce lameness with a strict culling policy and targeted use of antibiotics to help reduce their overall use of antibiotics, and they have used faecal egg counts to assess wormer resistance and maintain an effective worming policy. Rampisham Manor Farms is participating in the AHDB funded challenge sheep project looking at the effects of replacement ewe management on their later life within the flock and Gareth is a finalist for the 2018 sheep farmer of the year award. South West Regional Manager Ian May said: “ It was great to see how Gareth and his small team have managed to build up an impressive enterprise over such a short period of time and we look forward to seeing how things develop in the future.